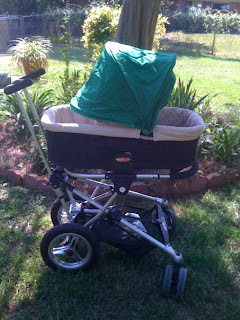 Super Hero Boy: I used to have dreams about owning a bassinet attachement for a stroller! I used to have dreams about owning a bassinet attachement for a stroller! I was downright giddy the day I found out that Scandinavian Child was sending me the Carrycot bassinet attachment for my Microlite Toro stroller. We've had our Microlite for quite some time now, though not since Connor was as little as Dylan, it's followed us everywhere and it's still my favorite all around stroller. Though now that I have the bassinet attachment it's become my new favorite baby accessory hands down. Actually I've had the Microlite Toro and Microlite Carrycot in use almost constantly since Dylan was born, just not together which sounds odd but let me explain. Chris works third shift and Dylan's bassinet is right next to our bed so on the day's Chris works I really hate to put Dylan down in his Carrycot while Chris is asleep. At the same time if I put Dylan down for his nap in the crib at the same time Connor is in his room the odds are I'll find both of them sleeping in the crib as Connor has picked up this nasty habit of climbing into the crib lately. Dylan is still just too small and I'm worried Connor might accidently hurt him. So the Microlite Carrycot has been hanging out in my living room as Connor's nap zone. Today was the first day that we really decided to spend a ton of time outside and Dylan was asleep so I just put his Microlite Carrycot on his Toro stroller and off we went. I can't even put together the words as how incredibly nice that was. We spent almost all day outside working on cleaning up the lawn and lawn furniture for Connor's birthday party this weekend and all the while Dylan napped happily in his Microlite Toro. If we needed to move to another part of the yard I just walked over and pushed him along with us to the next shady spot. Connor got to play outside to his little heart's content and Dylan napped like nothing had changed. Actually once Dylan did wake up he laid pretty happy in his Carrycot and looked up at the tree above him. If you can spot them in the picture you can actually see his feet sticking up out of the bassinet. He was busy talking to the tree the moment I snapped the shot of the Microlite. The Microlite Carrycot is surprisingly roomy and honestly I think it's easily if not larger inside than our bassinet that sits in the bedroom. Dylan has tons of room to wiggle and I'm certain he will far outgrow it by being able to sit up than size. The Microlite Carrycot is for children under 20lbs or able to sit upright. To use it with your Microlite stroller all you have to do is remove the seat, lay the frame where the seat would have been flat, and attach two adapters onto the frame. I should let you guys know that the adapters that work with the Carrycot are also the same adapters that work with the MaxiCosi car seats which is PERFECT for us as we have both. I just snap off my MaxiCosi car seat and snap on my Carrycot. The Carrycot also works great all by itself. It's got a rigid frame so its perfectly safe to use as a place for the baby to nap. Without the stroller the Carrycot works just like a moses basket complete with carrying handles on both sides. The one big exception is it has a fully functional and really adjustable hood that can be moved in almost any position you'd like. As well a boot is included that covers the baby while in the bassinet for colder weather. I'm not sure we will get a chance to use the boot in the summer in Alabama but it would have been wonderful when we still lived in Illinois! The Microlite Carrycot works with the Toro and can be purchased together with the Toro as part of the Microlite Toro Newborn System or by itself as an accessory. If you would like to buy your own you can check them out on the Scandinavian Child online store! Disclosure: We received a Microlite Carrycot to do this review. My opinions and comments on items we review are always my own and are never influenced by sponsors.